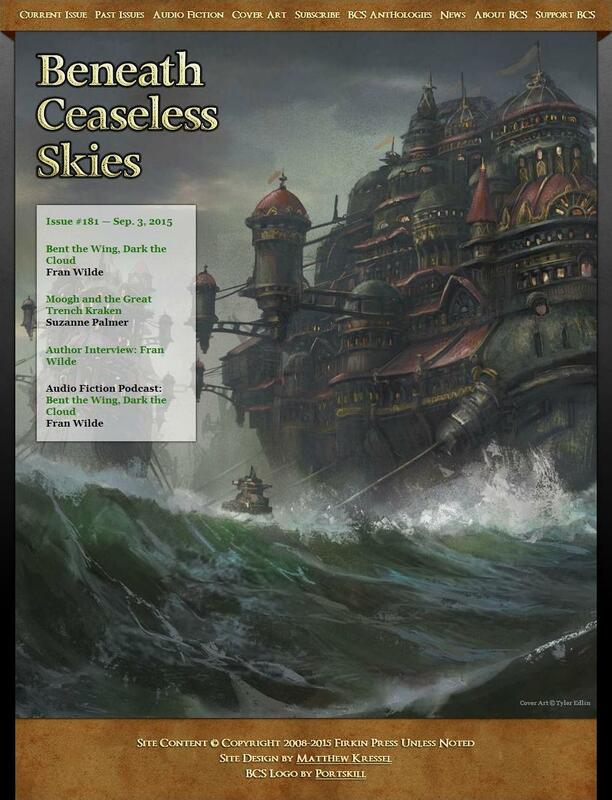 Beneath Ceaseless Skies #181 has new stories by Fran Wilde and Suzanne Palmer, a podcast by Fran Wilde, and a reprint by Ferrett Steinmetz. In the sky behind, a group of children Calli’s age swooped and dove in unison, followed by one of the tower’s magisters. Calli heard scraps of song. A lesson about wind shifts. The students’ wings cut patches of bright color in the deep blue air. Calli knew each span and spar, even from this distance. She’d tested them all. Liras tried to remain at his workbench and finish the customer’s wings, but the pain grew too much. Fran Wilde’s story “Bent the Wing, Dark the Cloud” is set in the same world as her just-released debut novel from Tor, Updraft. And we recently reviewed Suzanne Palmer’s excellent story “Tuesdays,” from the March 2015 issue of Asimov’s Science Fiction. Issue 181 was published on September 3, 2015. Read it online completely free here. The cover art this issue is “Kodran Migrant Fleet” by Tyler Edlin. 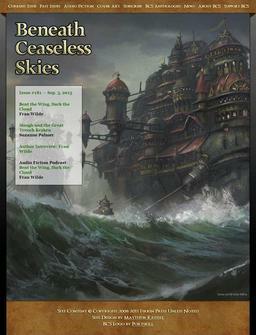 We last covered Beneath Ceaseless Skies with issue 180. Our September Fantasy Magazine Rack is here. See all of our recent fantasy magazine coverage here.